Facebook vs Pinterest Which Is The Best? 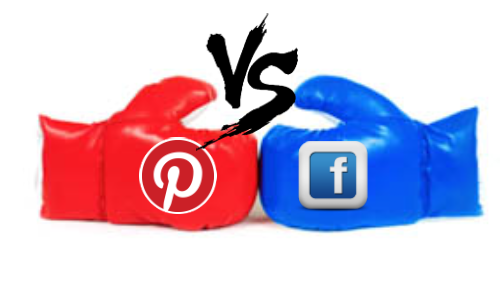 Facebook vs Pinterest Which is the best? This is a question I have heard many people ask over the last couple of months. That’s why I thought it would be a goo idea to compare them both and let you decide! In this article, we’ll be discussing Facebook vs Pinterest Which Is The Best. Facebook has over 900 million active users (and counting). 500 of these are people who use Facebook daily. At the same time, Pinterest has over 10 million users, 98% of whom have a Facebook and/or Twitter account. As you can already see, Facebook has a much larger audience. When you share your content online, you are alway looking to reach and affect as many people as possible. But depending on what you are looking to do and the goal with your social media presence is , the numbers might not always be that important because there’s no way in he… you´ll ever reach all of those 900 or 10 million users. Even if you’re Kim Kardashian. According to a study Pinterest ran with Millward Brown, 87% of Pinterest’s 100 million monthly active users have made a purchase after seeing a product they liked on the platform. This means that as a business trying to increase its sales, Pinterest is the way to go. Although the best is of course using both. If you however have other interests with your social media, Facebook might be for you. Below, you can find some stats to really get a picture of what the different applications can contribute with. The true answer to the question “Facebook vs Pinterest Which is the best?” is that it really depends on you and your objectives – and of course, your demographics. What you need to do is to evaluate what exactly what you gain from sharing visual content. Perhaps your business is only interested in growing your brand awareness and reach, then Facebook might be the right tool for you, as mentioned. But if your business is trying to increase sales, you might want to focus on Pinterest. What you should do is TRY! And you’ll see which suits your purpose the best.